From Kate: Since it is SMA Awareness Month, let’s talk facts about Spinal Muscular Atrophy. 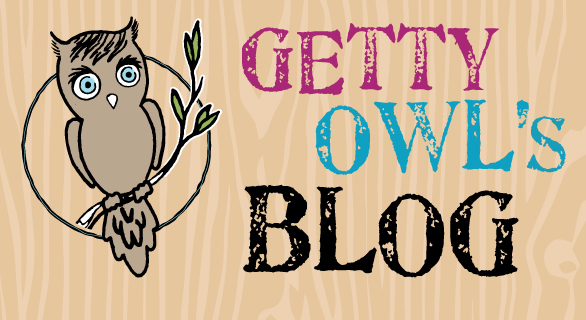 I know for us, we had never heard of it until Getty was diagnosed and perhaps someone reading will be motivated to share these facts with others and perhaps awareness can continue to spread. Interesting enough, since Getty’s diagnosis, we have learned of many families on a similar journey through friend of friends. Which tells us that this disease affects all people, all age groups, all genders, and all really everything that links us as human beings. It is so important to talk about and discuss aspects of SMA. I hate to think that this genetic disease continues to hide in the shadows until an unsuspecting family is given a similar diagnosis and prognosis. -Here are some facts about SMA: -Spinal Muscular Atrophy is a genetic disease that causes progressive muscle degeneration and weakness. Individuals with SMA develop feeding and breathing problems as the weakness gets worse over time. -SMA is caused by a mutation in the survival motor neuron gene 1 (SMN1). In healthy individuals, this gene produces a protein that is critical to the function of the nerves that control our muscles. Without them, nerve cells cannot properly function and eventually die, leading to debilitating and often fatal muscle weakness. -SMA is still the #1 genetic killer of young children. -SMA affects approximately 1 in 11,000 babies. 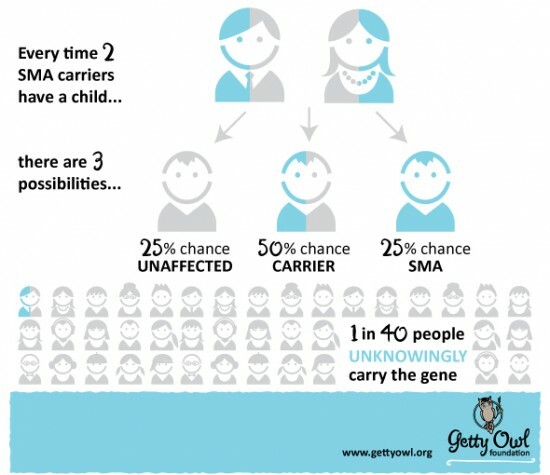 -1 in every 5o Americans is a genetic carrier of SMA. *To put this into perspective, I have two examples to think about. Our house loves Adele and I was lucky enough to see her show in Oakland, CA. Sometimes I can be a wet blanket when I am among lots of people because my mind goes straight to statistics. “You know there are at least 390 SMA carriers here, I wonder if they are aware?” Taking it to another level you think about compete totals of Adele’s American Tour, she sold over 750,000 tickets. So it is possible that over 15,000 people who went to her performance in America was a carrier of SMA. That is more people than the population of Healdsburg, CA; more than St. Augustine, FL; and more than Sedona, AZ. * I want to apologize for the inaccurate 1 in 40 statistic. Oddly enough, August actually snuck up on us as well and I failed to make an updated image. My apologies, but I hope is that it helps offer some information. What is important to understand is what chances look like for two SMA carriers. When two SMA carriers have a child, there will ALWAYS be a 25% chance of having a child affected by SMA. The statistic that I always get overwhelmed by is the fact that 50% of children born to two SMA carrying parents, can become SMA carriers themselves. In an of itself, that is just math. What makes that overwhelming is that there are so many people out there who may not know they are SMA carriers. This silent genetic disease continues to propagate into our population and unfortunately leading to another unsuspecting family that will at some point, get the heart breaking news that their child has SMA. -SMA is a pan-ethnic disease and does not discriminate based on race, ethnicity, or gender. -There are 4 Types of SMA: I, II, III, IV, which is based on age and highest milestone achieved. For more detail about Types, go HERE. -These are just a few of the real facts and statistics about SMA. For the second year in a row, we are able to rejoice in the new fact that there IS A TREATMENT!!!!!!!!! -Spinraza was approved by the FDA on December 23, 2016 and it has become a game changer for many people affected by SMA. To learn more about Spinraza go HERE.